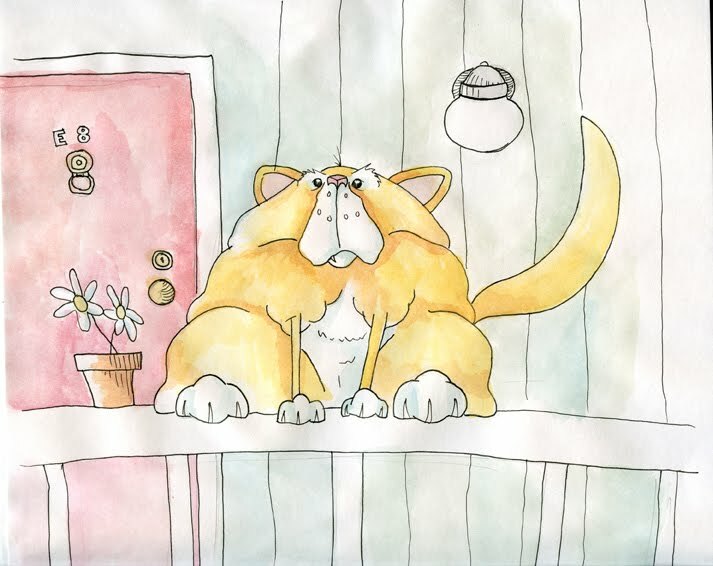 I recently moved to a new apartment and have been surprised at the large number of cats...I've counted 6 'regulars' to this point...and not just any cats...but all of them are very large...and they are always drooped over railings with flaps of skin and fat acting as a grip. One particularly large feline that hangs directly over where I walk I nicknamed 'Layers'...because he's got them. On a seemingly unrelated note...I'm a school teacher...and as most folks know school teachers often help out of pocket with supplies...I demand a lot out of my students because I know what they are walking into as they shift into college...and I understand that they sometimes have less freedom to go out and get items they might need for projects...I want them to have the best shot at scholarships possible because there are times that is the only way they will be able to get their foot in the door for college. That might mean buying actual art supplies or even driving around and searching for props...one of the funner ones was driving around to every goodwill and thrift store within a 3 hour radius to find a certain shirt logo...To help with this I am selling some of my stuff or creating some work specifically to sell. 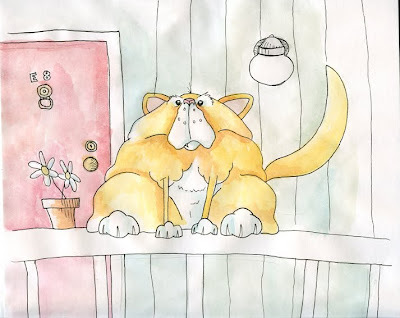 If you wouldn't mind on occasion pop on over to my Blankenstine Is a Sellout blog and see if there might be something you like. Or if you've seen anything I've done in the past you liked I might be able to recreate or even sell the original (provided it hasn't been promised to my own kids). And he's got layers of character! I didn't know teachers like you still existed; bless your little cotton socks. He's really cute.I love his skinny little legs. Love your "layers"! Cats crack me up and you captured this one beautifully! And I also love your other work from watercolor dinosaurs to sculpty piggy critters. And semi-related to that topic, or at least to the stegosaurus-esque reproductions, I've been exploring larger-format printers (like you, always shrinking images to fit on 8.5x11 format), which printer did you choose? awwesome and CREEPY as charles laughton's, um, "layers", bb! great character! what a noble dude you are, too. selling out for your kids. bravo! Cat funny! i lke the colors and your style. Great illustration! That cat lives at my house and his name is Oscar! Lol! I'm not kidding! It's teachers like you that makes life wonderful! If no one ever said it, Thank you for being you!